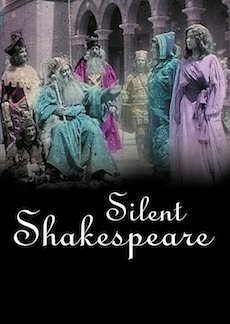 A unique collection of seven early Shakespeare adaptations – made between 1899 and 1911 – mastered from the only known surviving materials. "The BFI should be congratulated on this DVD. It provides a rare opportunity to see these beautiful early films which are now much too fragile to project"
The cinema's love affair with Shakespeare dates from the earliest days of film. In its infancy film was regarded as a rather lowbrow medium, and the budding film industry attempted to elevate its cultural status by imitating the theatre. Adapting the works of Shakespeare was the filmmakers' greatest challenge, especially since films at that time – before WWI – tended to be only one or two reels long. The seven films in this unique collection – from Britain, Italy and the USA – are created from the only known surviving materials, nitrate prints preserved by the BFI's National Archive. They include beautiful examples of hand stencilling and tinted prints. There is a magical version of A Midsummer Night's Dream containing some remarkable special effects, a charming five-minute film of The Tempest, and the very first Shakespeare film ever made, King John, in 1899. This unique and fascinating record shows us the exuberance, invention and conviction of these early filmmakers and demonstrates the possibility of the Shakespearean text. Filmed introduction and commentary by Judith Buchanan, lecturer in Film Studies at the University of York. Sleeve notes by Nicci Gerrard and bibliography.